According to PMP PMBOK 5th edition, group decision making techniques that a project manager can choose are: unanimity, majority, plurality and dictatorship. Although Group Decision Making Techniques are considered as a tool or technique in Project Scope Management Collect Requirements Process and Validate Scope process, these 4 methods listed here can be used in any group activity where a solid decision should be set. 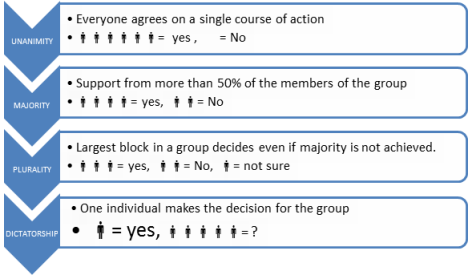 Four group decision making techniques define how the resultant output for a group activity will be set. Here is the list of group decision making techniques that project managers should prefer according to PMBOK 5th Edition. I liked this picture summarizing the group decision making techniques very well. It emphasizes on the differences between each method to make clear in readers minds. Unanimity: Every group member agrees to the same decision. Everyone in the activity group should come to an agreement. Majority: At least half of the group members should agree on the same result. More than the fifty percent of the group members are necessary to make a decision for the name of the group. Plurality: 50% of a group is not required in this case. Instead the decision is taken by the biggest block of people that come to the same result within the activity group. Dictatorship: There is person who has the authority to take the decision for the all group members. The other ideas mentioned be other group members is not important.